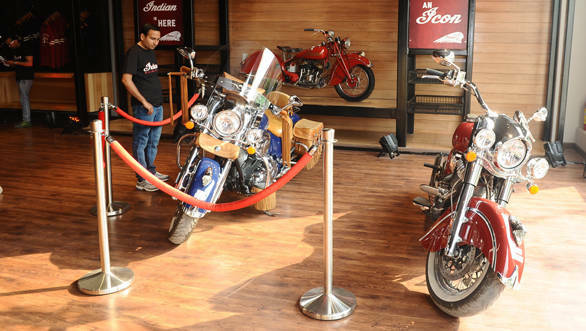 Indian Motorcycle has opened its first dealership in the country at Gurgaon. 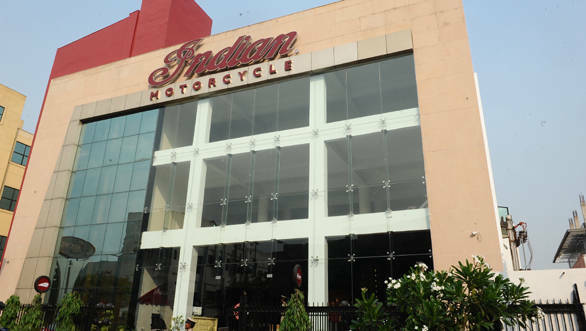 Indian Motorcycle Gurgaon is located at B-10, Info City, Sector 34 and has a total display capacity of nine motorcycles. The design of the showroom is inspired by the original facility of Indian Motorcycle located in Springfield, Massachusetts. The showroom will not only treat visitors with the entire display of its cruisers but will also have a section containing exclusive merchandise. 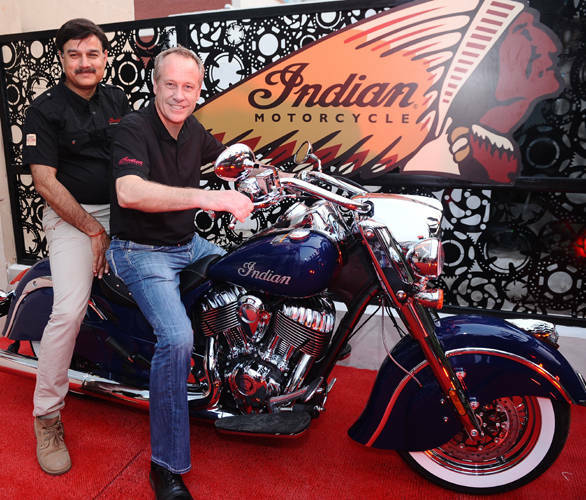 Indian Motorcycles Gurgaon is the first of three dealerships that the manufacturer has planned for this year. The other two dealerships will be coming up at Bangalore and Mumbai by year end. The other two dealerships will be coming up at Bangalore and Mumbai. Bennett J. Morgan, global chief operating officer, Polaris Industries Inc, who inaugurated the showroom, had this to share,"With a showroom design inspired by the original home of the Indian Motorcycle in Springfield Massachusetts, dealers and consumers will experience the brand as never before. Motorcycles, apparel, and accessories will be displayed in a retail environment that is both premium and approachable. It will become a destination for riders and they will want to spend time interacting with the brand as well as the store." Indian Motorcycle have all their three models on offer in India, the Chief, Chief Vintage and the flagship- Chieftain. The models come in through the CBU route and this means they don't come cheap. The range starts from Rs 26.5 lakh (ex-showroom, Delhi). The engine powering the entire lineup is the smooth and silky 1811cc, V-twin Thunderstroke engine, which makes 138.9Nm at just 2600rpm. Putting this power to the road is a six speed gearbox. Iconic Indian Motorcycle® rides into Haryana; country's first dealership inaugurated in Gurgaon 	Located in the heart of the commercial hub of Gurgaon, Haryana at B-10, Info City, Sector 34 	Showroom can display 9 motorcycles 	Global standards of after-sales and service support to further add to the overall experience of owning an Indian Motorcycle® 	To open 2 dealerships in India by year end 	Dealership inaugurated by Mr. Bennett J. Morgan, Global Chief Operating Officer, Polaris Industries Inc. ; Mr. Pankaj Dubey, Managing Director, Polaris India Pvt. Ltd. ; and Mr. Sandeep Bansil, Dealer Principal, Indian Motorcycle Gurgaon, May 7th, 2014: Bringing history live on the roads of India, Polaris India Pvt. Ltd., a wholly owned subsidiary of Polaris Industries Inc., the world leader in Off-Road and All-Terrain Vehicles has inaugurated the country's first Indian Motorcycle® showroom in Gurgaon, Haryana. This world-class showroom was inaugurated by Mr. Bennett J. Morgan, Global Chief Operating Officer, Polaris Industries Inc. and Mr. Pankaj Dubey, Managing Director, Polaris India Pvt. Ltd. along with Mr. Sandeep Bansil, Dealer Principal, Indian Motorcycle®. With this strategic announcement, Polaris India has brought the iconic motorcycle brand closer to the Indian biking enthusiasts. "With a showroom design inspired by the original home of the Indian Motorcycle in Springfield Massachusetts, dealers and consumers will experience the brand as never before. Motorcycles, apparel, and accessories will be displayed in a retail environment that is both premium and approachable. It will become a destination for riders and they will want to spend time interacting with the brand as well as the store," said Mr. Bennett J. Morgan, Global Chief Operating Officer, Polaris Industries Inc. "The very first showroom to display and retail the legendary Indian Motorcycle® holds great importance for us. It is the first interface where we are giving an opportunity to biking enthusiasts to own a slice of history with a contemporary twist. The start of the Indian Motorcycle's® dealer network in India reinforces the company's serious commitment towards growing its footprint in the country and reaching out to Indian Motorcycle® fans. This year we intend to open 2 dealerships in India," said Mr. Pankaj Dubey, Managing Director, Polaris India Pvt. Ltd. The showroom, located at B-10, Info City, Sector 34, Gurgaon, Haryana, can display upto 9 motorcycles. The entire range of the Indian Motorcycle®: Indian Chief Classic, Indian Chief Vintage and Indian Chieftain models will be available at the Gurgaon dealership. The team at the dealership will comprise of trained professionals offering global standards of after-sales and service support to add to the overall experience of owning an Indian Motorcycle®. The state-of-the-art showroom combines global architectural standards and infrastructure synonymous with the reputed legendary brand under one roof. Besides being a visual delight with the entire range of Indian Motorcycle® on display, the dealership also boasts of attractive merchandise to enthuse the visitors and customers. Indian Motorcycle is an iconic brand that gained immense popularity across world geography. In April 2011, Polaris Industries acquired Indian Motorcycle and in August 2013, it unveiled the all-new range of Indian motorcycles in the USA. Since the April 2011 acquisition of Indian Motorcycle by Polaris Industries, the company has made an unprecedented commitment of time, resources and passion into the design of the all-new power plant. From the outset, the goal was to capture the iconic design and styling aspects of the 113-year old brand's most historic models and fuse that heritage with state-of-the-art technology and progressive design elements. The new design reflects an unparalleled investment into researching the complete history of Indian Motorcycle power train development.